Blanco Encalada, Atacama desert, Chile, Feebruary 2014. They really are stunning plants and among the most sought after of the Copiapoas. Unfortunately they are incredibly slow at growing (also grafted seedlings are still extremely slow). The plant produces only a few spines each year and the seedling on their own roots are slowest than the aztekiums! 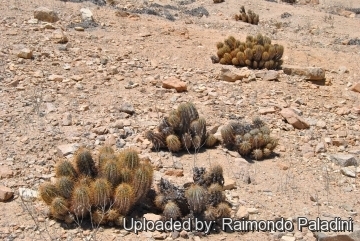 Origin and Habitat: Copiapoa solaris comes from the northern part of the range. 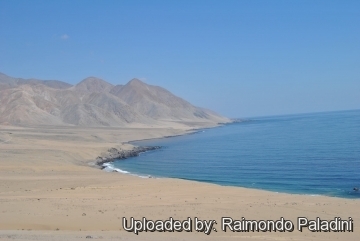 It is endemic to a restricted area and its population is severely fragmented and there are only two locations centred around the localities of Blanco Encalada and El Cobre, south of Antofagasta (extent of occurrence of 1,500 km2 ). Chile ('El Cobre‘ means 'The Copper‘, reflecting the presence of copper deposits in the area). The populations can be very abundant locally. Altitude range: It is found at elevations of 600 to over 1,000 metres above sea level. Habitat: Although found near the coast this is predominately a mountain species. 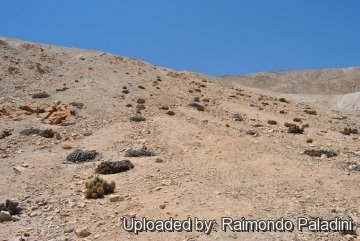 It grows on slopes (lomas costeras), on granitic soils steeply emerging from the ocean and landwards, leading to the barren Atacama Desert up to 1000 m of altitude. 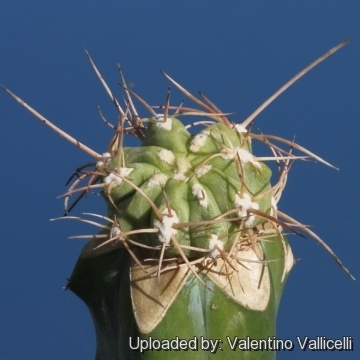 They grow in a very arid desert climate with strong oceanic influence and high cloud cover. Characterized by twelve arid months, no frost, an average temper­ature of 17.2°C and an annual rainfall of only 4 mm!. Rare events of strong rainfalls may occur unpredictably providing a flush of ephemerals growth as well as new seedlings. The extreme aridity is attenuated by the frequent, often dense, coastal fogs. The fog tends to concentrate in the form of a cloud band at an estimated height of 500 to 850 m. It shows a recurrent pattern; usually it is overcast in the early mornings, the clouds dissipating during the late morning and returning during the late afternoons. Winds from SW and S are prevalent. In habitat a very high percentage plants appear to be dead, this is not due to an environmental disaster, but to the preserving desert conditions that are radically different from those common on other natural environments, where dead material would be quickly cleared from the landscape. The process of bacterial decomposition is extremely slow, so that it is likely that the dead clumps are the result of tens if not hundreds of years of decay. The spiny cushions also provide shelter to a great quantity of insects and reptiles. Survival and growth of C. solaris is a remarkable achievement, as it is by far the dominant vascular plant in this bare desert ecosystem. The plant survives by storing water in its roots and body. The major threats are mining and its derivatives like dust. Presumably global climate change is affecting the subpopulations through prolonged droughts that the plants do not survive. The species does not occur within any protected areas. The species is used as an ornamental for specialised collections outside Chile. 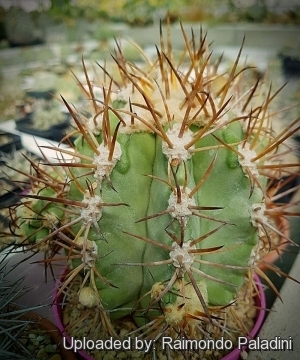 Copiapoa solaris f. cristata hort. 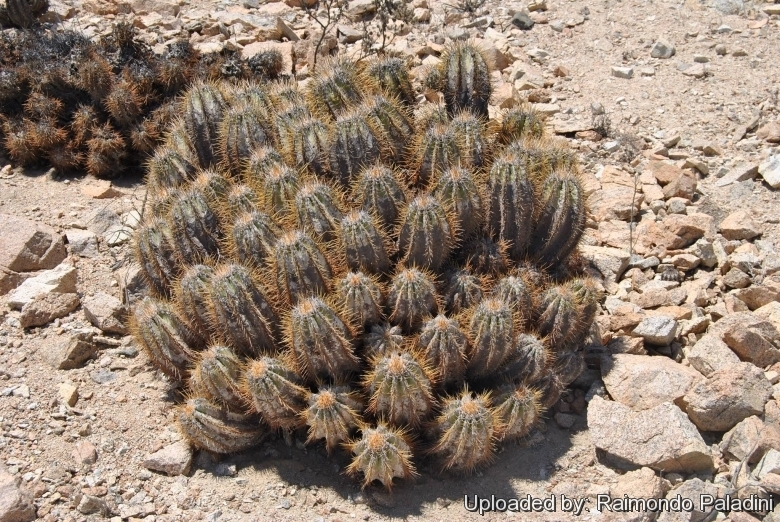 Description: Copiapoa solaris is a slowly clumping cactus with a cushion like growth form. They are incredibly slow growing, but old plants in habitat - over centuries - will form large cushion up to 2,30 m of diameter and 90 cm tall with hundreds of heads. Stems: Individual stems 8-12 cm in diameter, cylindrical green to grey-green with a waxy coating presumably to prevent desiccation in it's extremely dry environment. Offsets appear as white blobs and take about six months to produce a spine or two. Ribs: 8-12 elevated, up to 3,5 cm tall, not tuberculate. Spines: Yellow, amber or reddish-brown when young, later chalky-grey, robust, straight or slightly bent, long and interwoven. Central spines: 2-5, 2-6 cm long. Radial spines: 7-10, 2-3 cm long. Flowers: Up to 3 cm long and in diameter, funnelform, yellow, occasionally with a pink or reddish coloured throat. The flowers are often almost concealed among the dense wool and spines at plant apex. Flower tube woolly (Hence the name Pilocopiapoa = hairy Copiapoa). It needs a lot of sunlight to bloom, so it's pretty rare to have blossoms when in cultivation in greenhouses. Fruits: Woolly, up to 15 mm in diameter. Copiapoa solaris (F.Ritter) F.Ritter: Old plants in habitat - over centuries - will form large cushion up to 2,30 m of diameter and 90 cm tall with hundreds of heads. 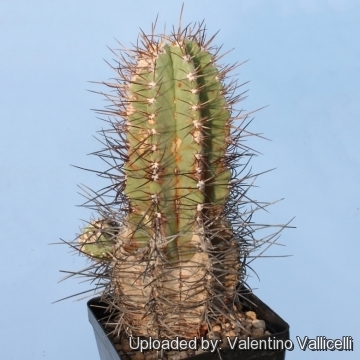 Copiapoa solaris f. cristata hort. : Crested form. 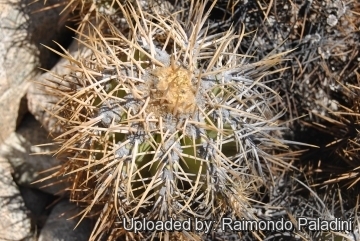 Copiapoa solaris var. fulvispina KK599 El Cobre, Blanco Encalada, 02 Antofagasta, 400m Kníže: Has amber coloured spines. 1) Walter, H.E., Faundez, L., Guerrero, P. & Saldivia, P. 2013. 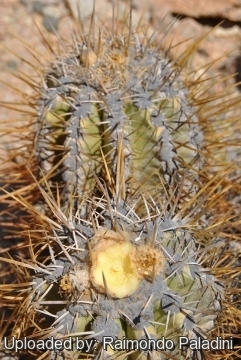 Copiapoa solaris. The IUCN Red List of Threatened Species. Version 2014.2. <www.iucnredlist.org>. Downloaded on 09 November 2014. Propagation: Seeds, but germinating is very slow (often taking a year to germinate) Grafting is often used to speed growth rate and to create a back-up to plants in collection.